Spring is here and it's time to switch out the fragrance you have been wearing over winter and replace it for something fresh! This means wonderful juicy and floral scents! 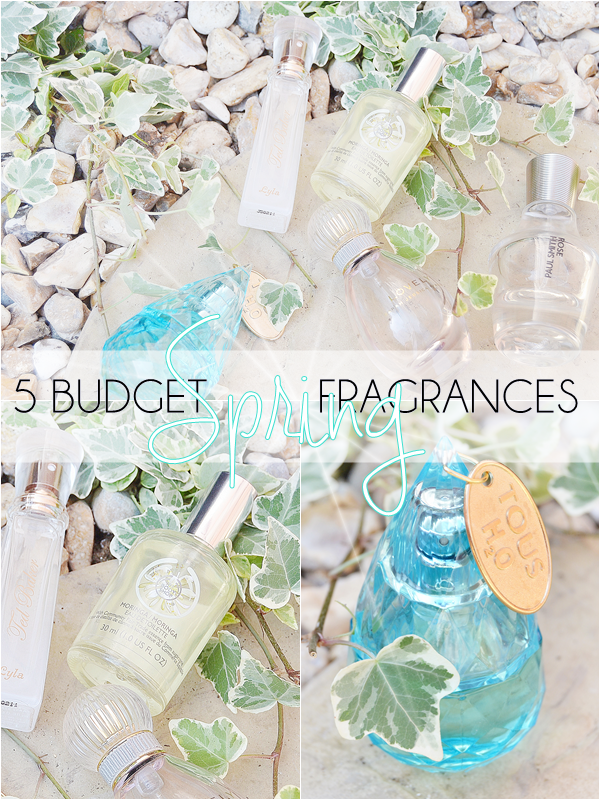 Below are five of my own favourite scents for Spring that come in at around £15 or under, making them the ideal little treat to add to your fragrance collection. This is a perfume I've repurchased so many times now as it's just a stunning scent for spring. Unlike a lot of rose perfumes this isn't stuffy or grandma like in any way but lovely and fresh, really a true rose scent! Other notes in this, though fairly subtle are violet (it adds a little sweetness), magnolia and green tea. If you are looking for a true floral fragrance for spring and love rose scents then this is certainly one to try. Another floral scent here but one that is so creamy and fresh! Perfectly feminine, this is a scent I wear on warm sunny spring days and literally inhale it in as I apply it - it's that good. If you are one for fresh white floral scents make sure to have a smell of this is The Body Shop. The body mist is also great! This is a perfume I seem to mention each year around Spring time as it's my ultimate go-to scent for when the weather warms up slightly. Why? Well it's just a beautiful and soft scent that despite it's budget price tag has a luxury feel to it and is instantly recognisable. For me this is a powdery clean white musk scent with floral notes. If you are looking for a grown-up soft spring scent then this is it! Onto the one with the oh so pretty bottle! Tous H2o is a great scent for both spring and summer as it's fresh and aquatic. The notes in this for me are lemon, rose and a light cedar to add a slight spice, but overall you do get that fresh 'water' scent that is perfect for warm days! Side note - Although it's cheap online it's worth looking in Boots for as I'm sure they are currently discontinuing the line... I recently picked up a back-up bottle for an amazing £2?! Another beautiful bottle here with the latest purse spray from Ted Baker (though the rose gold crystal top did fall off because I took it on holiday with me!). This is sweet floral scent with notes of grapefruit, peach, jasmine and rose, which combined give a very light but slightly fizzy sweet scent. If you like your scents fun and fresh then this is for you. I've tried a lot of the Ted Baker scents now and this is so far my favourite - perfect for both spring/summer and ideal for keeping in your handbag. Let me know if you pick up any of these up! 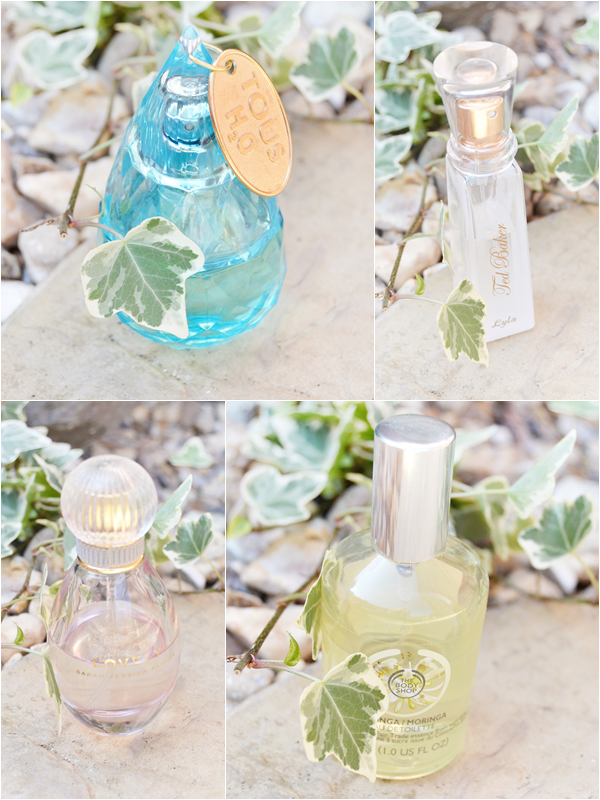 What is your favourite spring scent?